PARIS: Not for the first time in recent years, Europe has descended into a deep freeze while the Arctic experiences record high temperatures, leaving scientists to ponder the role global warming may play in turning winter weather upside down. On Sunday, meanwhile, air temperatures at the North Pole — which won’t see the Sun until March — rose above freezing. “In relative terms, that’s a 30 C (54 degrees Fahrenheit) temperature anomaly,” Robert Rohde, lead scientist at Berkeley Earth in Washington, tweeted. In one region, around Svalbard, the area covered by sea ice — 205,727 square kilometres — on Monday was less than half the average for the period 1981-2010, the Norway Ice Service reported. 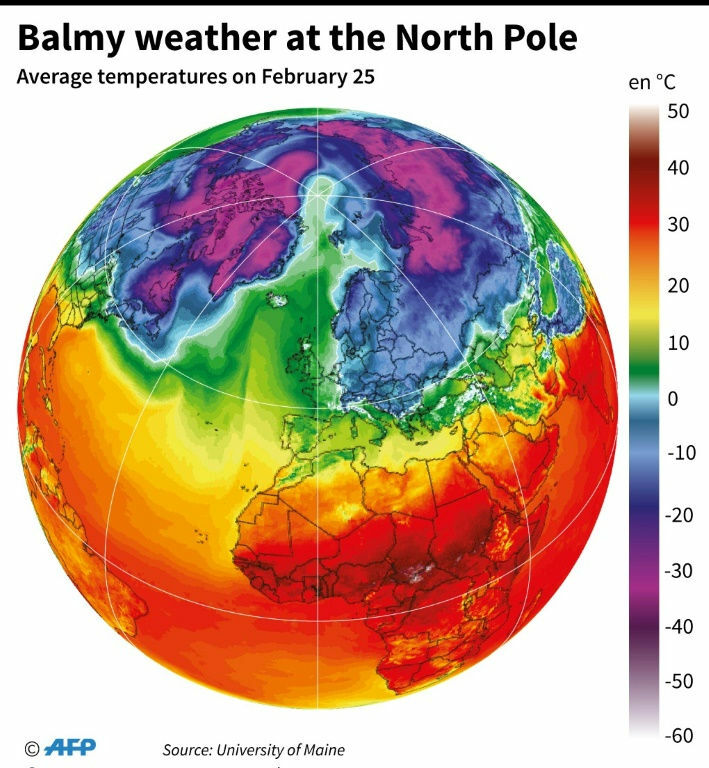 “Positive temperatures near the North Pole in winter are thought to have occurred during four winters between 1980 and 2010,” Robert Graham, a climate scientist at the Norwegian Polar Institute, told AFP. This acceleration, experts said, circumstantially points to climate change, which has — over the same period — warmed the Arctic region twice as fast as the global average. “The surge of mild weather at the North Pole and the cold front in Europe are directly linked,” Etienne Kapikian, a scientist at Meteo France, the national weather service, told AFP. “Just how hot is the Arctic now?” tweeted Peter Gleick, president emeritus of the Pacific Institute and a member of the US National Academy of Science. Gleick’s larger assertion is no longer seriously contested, but the link between the “warm Arctic, cold continent” phenomenon and global warming has yet to be proven, other scientists say. If the connection with global warming remains speculative, the mechanics of what scientists call “sudden stratospheric warming” — the weird winter weather’s immediate cause — is well understood. Strong winds in the stratosphere circulate west-to-east over the Arctic some 30 kilometres above Earth’s surface. This is the polar vortex. Freezing Arctic air that is normally “locked” in the polar vortex breaks out, creating the Siberian cold front that has blanketed Europe. But over the last two decades, the vortex’s breakdowns have become deeper and more persistent. “Overall, the global warming trend is clear,” said Kretschmer. Earth’s average surface temperature has gone up by one degree Celsius since the mid-19th century — enough to unleash deadly drought, heatwaves, and storms engorged by rising seas. One theory holds that newly ice-free ocean surface — which absorbs the Sun’s rays rather than bouncing them back into space like snow — releases warmth into the air that eventually disrupts the stratosphere. “It is hard to say that any one event is linked to global warming,” said Kretschmer.